Big Apple’s 24-hour Bar and Billiards at Sabang Beach is the latest attraction in Puerto Galera. Located at the entrance of Big Apple Dive Resort overlooking Sabang Beach and the crystal blue waters, making the place to be seen in Puerto Galera. The Bar offers a wide selection of both local and imported drinks including beers, soft drinks, spirits and delicious cocktails at affordable prices. The pride of the Philippines, San Miguel Pale Pilsen is available ice cold for only P29 during the longest happy hour in Sabang Beach. The Bar has 2 first class billiard tables and cable television where you can watch all the international sporting and news events 24 hours a day. 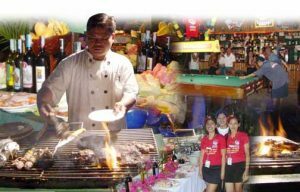 The Bar serves an extensive menu of Asian, European and unique dishes at affordable prices, with our daily “Eat all you can buffets”. After 10 pm, The Bar transforms itself into the hottest disco night spot on the beach, where you can enjoy great music, meet new friends and savor the cool night breeze while waiting for the famous Philippine sunrise. Big Apple Dive Resort has the largest swimming pool in Puerto Galera. This is an ideal venue for relaxing while laying in the sand and enjoying a refreshing swim in our fresh water swimming pool. For those who are embarking on their PADI Dive Course, our swimming pool has a ten-foot deep end which allows you to experience your first underwater dive in comfort and safety.